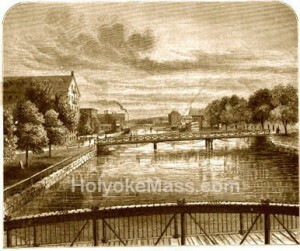 Holyoke, Dec. 13 — While the controversy continues between Mayor Toepfert and Francis H. King, manager of the Gas & Electric Department over who broke the faith with whom, there was one major new development today regarding the proposed project of the municipal department to take over the hydroelectric business of the cit y and the area. The Eagle Lodge of Papermakers, which previously endorsed the municipal department’s plan, now through its president, Edward G. Zakrzewski states its opposition to one phase of the project. The union is unalterably opposed to the filling in of the canal system, a part of the program which would deprive the paper mill owners of their present water power rights. The union claims that the water rights of the local paper mills are among the major assets which manufacturers possess and thereby gives to them an opportunity to meet the competition with the fine writing paper makers of the Midwest. The plan to fill in the canals in the opinion of the union would seriously endanger the jobs of its members and for this reason the opposition is recorded. Under the proposed plan process water now furnished through the canal sustem would be supplied through conduits which would run along the present canal lines. Eagle Lodge let it be known, however, that it still favors the requested survey with the hope of providing a better power program for the city. The board of aldermen will act on the veto of Mayor Toepfert Tuesday night and there is little indication now as to how the members will vote. Mayor Toepfert vetoes the order passed by the aldermen which endorsed the action of the Gas & Electric Department in seeking a permit from the Federal Power Commission for a preliminary authorization fo36 months for the power development project. Last Tuesday the aldermen gave a public hearing on the order and there was united opposition expressed by manufacturers against the plan. Representatives of the Gas & Electric Department were recorded in favor. During the hearing Manager King read a letter signed by both him and Mayor Toepfert in which the latter favored a new order which was to be presented to the aldermen Tuesday night. This order would call for a survey. King was accused of breaking faith with the mayor by reading the letter publicly. Up to now it has not been fully decided if the the order will go before the board of that the aldermen will act only on the vetoes order. I did not know that there was once a “plan to fill in the canals.” I’m sure glad that plan died!